How to compare releases before deployment and track drift afterwards. RapidDeploy allows you to automatically or manually create point in time versions of a Project which will include the Orchestration (deployment model), external or internal resources and target configurations. These versions can be replayed into the target environments to bring the target to a ‘desired state’ based on any of the versions that were created for the project. The versions of the project and external resources can be stored either in a local or remote filesystem, or in a remote Maven, Nexus or Artifactory repository, depending on the Artifact plugin chosen for the project. We can compare these versions with one another to see what was changed in previous deployments, what we expect to change in the next deployment and cumulative change over time. You perform the comparisons on the ‘Project‘ -> ‘Packages‘ tab. We also have the ability to ‘Snapshot‘ target configurations periodically, or before and after a deployment, to see what actually did change in the target. The screens are similar to the ones shown below for package comparison, but are accessed from the ‘Installation‘ panels. Shows all the retained versions for the project, with the Actions column showing ability to select versions for comparison. Any of these versions can be replayed to any of the Project targets. Clicking on the 'Panel Expansion' button to the left of the package link, shows a summary of the manifest for the package. Clicking on the link shows more detail about the package. Shows the comparison of two versions with 'Drill Down'. All changed files are shown in amber. New files are shown in green, and deleted files in red. The user can click on any of the magnifying glass icons to the right of the file, to see highlighted line level differences in the file, shown below. 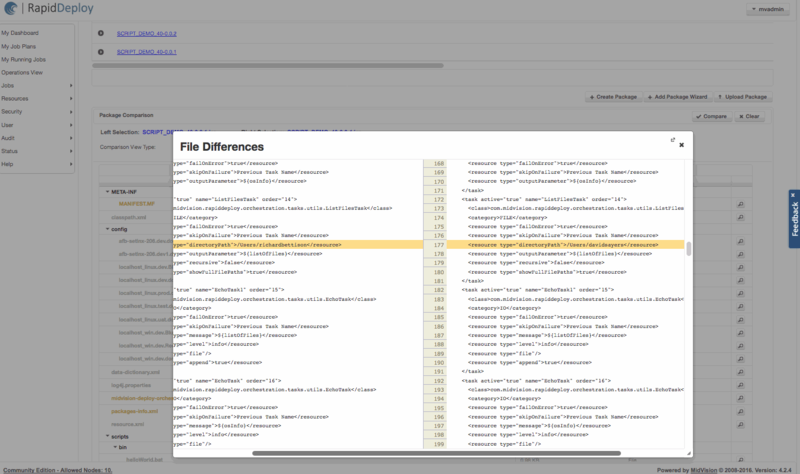 Shows the comparison of two versions of a file with line level comparison.